After arriving by charter flight to Kangerlussuaq, Greenland, we immediately boarded buses bound to the small pier where we would catch a tender. The darkness hid the landscape, which I imagined as stark and barren. Our luggage had arrived separately from the bus and I had not seen it since the Copenhagen airport and stressed about that despite confirmations that it would be taken care of for us. We stood in the cold waiting for the tenders to do their rounds. I was happy to finally board and kept my hood pulled way over my head as we traveled by the light of a near full moon. Boarding late at night by tender, no less, seemed the perfect intro to the adventure cruise on Hurtigruten Fram. After registering on the ship, we were instructed to go get fitted for our red jackets. The stern assistant in that room, eyed me up and down and tossed me a jacket. I felt compelled to take whatever size he gave me no matter if it fit properly or not. Once I received it I marked my name on the inside in huge letters. With a plethora of jackets floating around the ship, I worried that I might misplace mine and be unable to identify it. In the end, that never happened and perhaps I was a bit too concerned about losing my water and wind resistant uniform. The dining room remained open late for snacks and drinks for those of us who needed something to sustain us until bedtime. Many of us stayed up into the wee hours of the night. 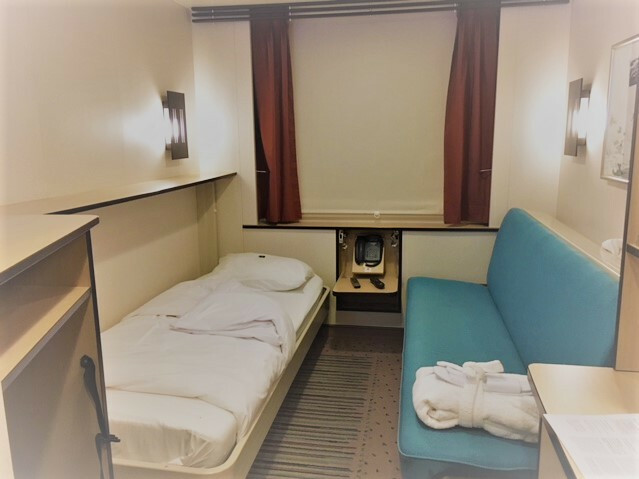 Cabins on the ship remind me of those on trains – most of the basic cabins are pullman style with beds that fold up to become seating during the day. This cabin worked for me as a solos cruise, but it would take some very efficient organizing to accommodate the belongings of two people. The closet has shelves, but no drawers at all. As far as amenities, slippers and robes were provided. Noticeably missing was any hand lotion, something extremely useful when cruising cold climes. I substituted the supplied hair conditioner, which helped relieve the dryness of my hands. Speaking of hair, the bathroom came equipped with a hair dryer. I rarely dry my hair, but due to the cooler weather, I attempted it to no avail. There is a real hair dryer in the locker room outside of the sauna. The force of the dryer supplied in the room may have dried one strand of nearly dry hair. A typical cabin on the Fram. The TV came with two remotes. I never found any news stations, but eventually figured out how to set the station with the daily program. 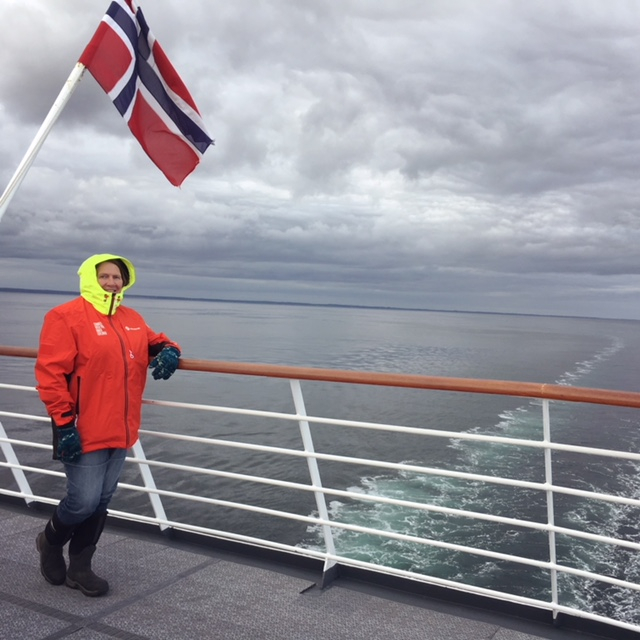 Hurtigruten tries practicing a green system and doesn’t print the programs for every guest. The program on the TV is in English or German and there is a print copy at information central down in the lobby. I don’t watch television at home, but thought a news channel would be a good option. Same with the radio – music would have been very pleasant to relax with. The radio option broadcast messages from the bridge and the expedition team. The outlets in the cabin take European plugs – the type with the two rounded poles; Hurtigruten is Norwegian after all. Two outlets at the desk made charging electronics and using the computer easy. And back to the hairdryers, and other appliances that you may bring along: I have heard enough people comment that their hairdryer got extremely red and hot. Many hairdryers only work on 110 volts. European electricity is on 220 volts. So even though you may have the plug adapter, you will still need a power converter. Of course, there are some hairdryers and other electrical appliances that switch between 220 and 110. Just remember to change to the proper voltage.